For patients who need to replace multiple missing teeth, we proudly offer the latest in denture technology as part of our restorative dental treatments. Our dentures are made to last and custom designed for optimal comfort and beautiful aesthetics. Whether you want to regain the smile you once had or finally achieve the smile of your dreams, we can help you with custom-crafted dentures at Riverheart Family Dentistry. Dr. Schwarz is an experienced dentist who values the importance of providing dentures that not only look like your natural teeth, but ones that feel and function naturally too. We don't want patients to avoid the foods they love, alter their speech or suffer from ill-fitting dentures. Today's denture options eliminate many of the past denture pitfalls. With personalized attention, strong expertise and the latest technology in modern dentistry, your dentures can create the confident and healthy smile you deserve. A full set of dentures is designed to replace an entire row of top or bottom teeth. Patients can choose between traditional or implant-supported dentures. Dr. Schwarz is happy to explain the differences and advantages of each as well as which option may suit your budget and lifestyle best. You can trust that our full dentures are durable, easy to maintain, and extremely natural looking. If you need to replace just a few missing teeth, partial dentures may be recommended. A partial can be secured with clips or brackets or anchored with dental implants. Again, Dr. Schwarz works closely with each patient to explain the available denture types and designs for your unique smile needs. We will walk you through the entire process so that you feel confident in your tooth replacement investment. We are always happy to make adjustments or repairs to your dentures if you are experiencing problems. Your smile should be something you are proud to show off and never something that disrupts your daily functions. To learn more about dentures from Riverheart Family Dentistry, please contact our office today. 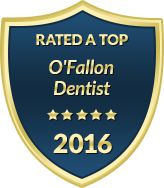 We are equipped to treat all types of smiles in O'Fallon, from pediatrics to geriatrics. We offer a comfortable and convenient dental care experience at all times. To make your dentures more affordable, please ask us about our financing plans.